Our full-service live chat software solution gives you instant access to customers via mobile chat (SMS and MMS) and web chat. Agents can engage customers in live online chatting via one comprehensive yet simplified interface, providing better customer service with less effort than ever. Provide Faster, Better Service To Web and Mobile Customers. The Route2Cloud chat system helps your business bridge communication gaps with instant access to mobile and online customers. Expand your reach to online consumers who spend more — and expect more. Provide speedy, convenient customer service across web-based chat, SMS text chat, and MMS mobile chat. Offer product or service assistance, converse in different languages, or present discounts and deals via informal conversation — all on the customer’s terms. There’s a reason they say a picture is worth a thousand words. Provide better service to your customers with multimedia messaging capabilities. Customers can send photos of their issues, and agents can respond with screenshots and more. Over 80% of online customers need live support while making online transactions. When a customer texts with a question, be ready to answer back via the same channel. If at any time they wish to switch to voice, agents can do so with the click of a button. Part of the convenience of texting is the ability to stop when you need to … and then pick up again where you left off at a later time. Let customers fit your service into their lives. You’ll reap the benefits of satisfied customers and increased loyalty. Save time and effort and stop switching between multiple windows, systems, devices, and/or applications. Route2Cloud’s sleek agent UI lets agents see all channels combined in one unified, intuitive interface. Agents spend less time navigating multiple elements and more time solving customer problems and making more informed sales. Our unifying live chat software is designed to eliminate confusion around chat information and channel origination. Agents can always see where each message came from and exactly how long ago it came in, and management can track all chats historically, with reports that deliver full chat routing information and details. We believe that online privacy is an important concern, and information security should not just be limited to the traditional channels. At Route2Cloud, we’ve made a promise to uphold the integrity and security of your data at all times. That’s why we encrypt our chat data with HTTPS encryption to ensure your information is safe and protected. If compliance is a concern, we also offer a chat redaction feature that identifies sensitive information in specific fields and masks it from both the agent and any reporting or recording functions. Your chat data is your business. We give you the tools to keep it as private as you like — or share it however you like. Use real-time information to provide better service. With our live chat preview feature, web-based chats refresh continuously, allowing agents to see what customers are typing, as they’re typing it. Agents no longer need to wait for the customer to finish typing their entire response — and pressing send — to gain insight into the customer’s needs. This allows agents to practice more proactive customer care. Agents can use the ‘head start’ to begin addressing the issues at hand, like taking more time to research the subject more thoroughly, while customers experience a new level of customer care, not to mention much faster responses, more in-depth replies, and speedier resolution of their issues. With an agent UI designed for simplicity and efficiency, agents can experience increased productivity while saving time and minimizing effort. All the relevant information they need is integrated in one easy-to-manage desktop, and our robust feature sets allow for smooth, timely, effective communications. Give agents the information they need to effectively manage chats in a timely manner. Unanswered or pending chats display a timestamp that lets the agent know how long a customer has been waiting for a response, leading to enhanced agent performance and increased customer satisfaction. Don’t waste time collecting information you already have. Display any information gathered in pre-chat forms to the agent immediately upon connection. Or integrate the information into their script so they can focus on collecting customer information you don’t already have. Enable fast, error-free responses. Speed up agent chat responses with hyperlinked ‘quick text’ replies. Drop special response text directly into your scripts and agents can click on the hyperlinked text to instantly copy it directly into their active chat conversation. And our intelligent software allows your browser’s spell-check functionality to remain enabled, giving your business that extra boost of professionalism. Admins and supervisors get all the tools they need to configure, monitor, track, report on, and optimize both the agent and the customer experience, creating effective workflows for enhanced customer experiences, and contributing directly to your (bigger) bottom line. Create tailored chat flows that ensure each chat is routed to the appropriate destination in the sequence of your choosing. Assign ranks to different queues to dictate the order in which chats will be received, and even choose specific agents to handle certain queues of your choice. Effortlessly gain control over your call center’s operations with Route2Cloud’s simple but granular security settings. Our robust security settings apply to chats of all originations; whether web-based, SMS, or MMS, all chats can be combined into one group or multiple groups for simplified permission-handling. You can permit, deny, and limit access to any chat user via the admin platform, and you can even choose who can view, edit, report on, or supervise each chat group. Take advantage of the diverse skills your agents bring to the table. Our configuration options allow you to route chats based on agent skill at any level. Spread different agent skills across various queues, or set a skill as a condition when creating a queue event. 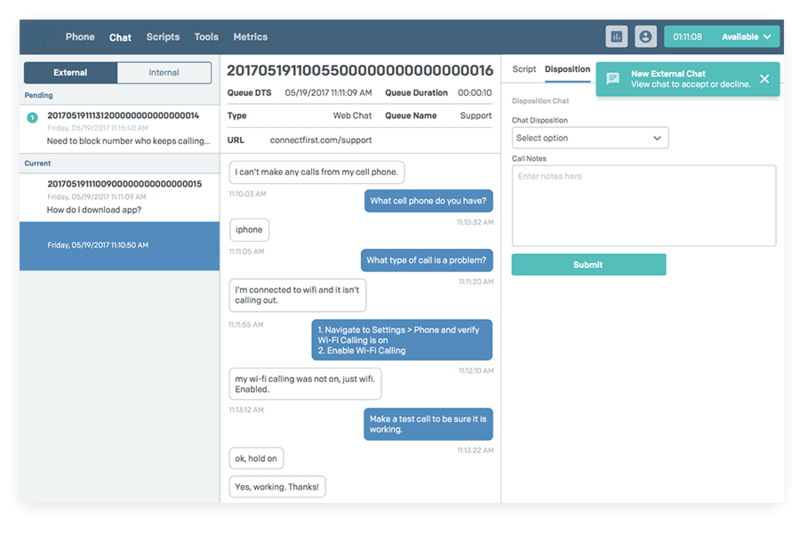 Create an ANI-based queue that routes calls with international area codes directly to agents who speak the corresponding language, or configure your chat flows to ensure VIP customers get the special treatment. Skills-based ranking guarantees important chats get routed to your top agents first, and your second and third-tier agents follow suit in the order you choose. As the end-user, your customer sees none of the behind-the-scenes process: all they experience is the magic of a helpful customer service representative who’s ready to provide effective answers and timely assistance, every step of the way — all within a 42-second average issue resolution time. Foster customer engagement while providing useful transparency. With our visible agent chat settings, customers can hear and see dynamic notifications when agents are responding. Never leave your customers wondering if their agent is still there, or if they’re ever going to reply. Chat should be easy for everyone, not just you and your agents. The Route2Cloud chat system requires no hardware or software installation on the customer’s end. They simply watch a chat bubble open dynamically, and they can instantly begin typing and receiving responses to all their questions. The easier you make the process for them, the better and more memorable their experience with your company. Customize your automations to provide useful, relevant assistance right where customers need it, right when they need it. WithRoute2Cloud’s flexible configuration options, the choice is always yours. Create customized timers that dictate when and where your chat window will appear. No more instant pop-ups that bother customers before they’ve even begun to read your page.